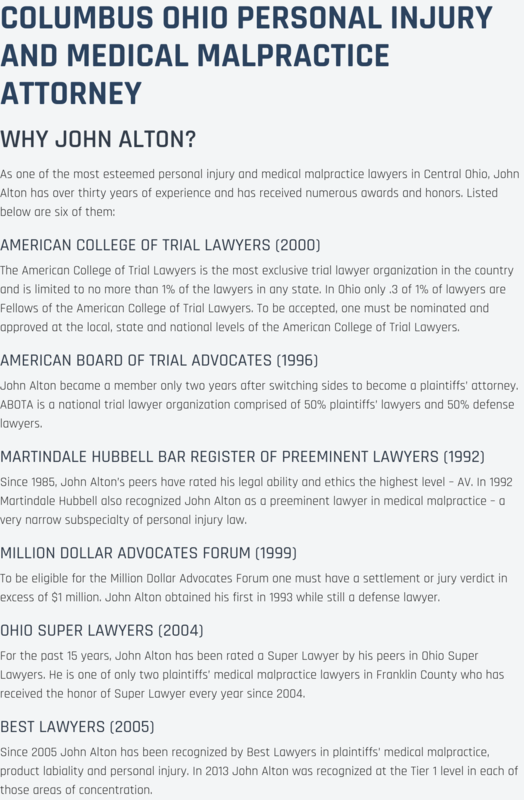 The Law Offices of John M Alton Co, LPA offers a unique blend of experience, skill and talent that enables me to resolve varied and complex issues with a personal and measured touch towards your injury matter. I always keep our client’s goals in mind when developing and implementing top-quality legal strategies for each specific injury case. 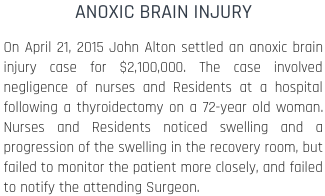 Allow The Law Offices of John M Alton Co, LPA in Dayton to assist your injury matter. I will attain for you a just resolution to resolve your injury matter as soon as possible. You may have suffered a injury and now must deal with it every day. 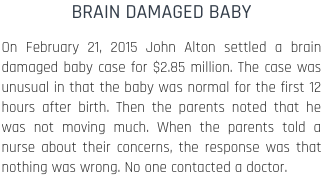 The Law Offices of John M Alton Co, LPA wants to help relieve that stress from your daily life. You should not have to suffer financial or emotional distress due to the negligence of someone else. At The Law Offices of John M Alton Co, LPA, I know how to best address your current legal situation. I know how to attain the results you want. If you are in the Dayton area, I can help you. The Law Offices of John M Alton Co, LPA has extensive courtroom experience. When it comes to injury cases; I have a proven record of challenging even the most powerful opponents with successful outcomes. Every time I am in court on your Dayton injury case, you can rest easy knowing that I am fighting for your interests. You will sleep better knowing that your injury case is being handled with the utmost attention to detail and skills to achieve the results you want. There are always important decisions happening with injury law, and The Law Offices of John M Alton Co, LPA stays up on everything. Through journals, review bulletins and networking with other attorneys, The Law Offices of John M Alton Co, LPA has an extensive system to ensure our practice is up-to-date. While we love the law, our injury council are always available to you. We have learned 25 years of practice this is the best way to ensure clients feel comfortable with their case. Contact us today to speak with a injury professional.